When collecting a series, sometimes the notes / coins / denominations you don’t see are almost as interesting and telling as the ones you do see. Of course, there are no notes denominated as 100 Billion, 200 billion, 500 Billion, 1 Trillion, or 5 Trillion in the 3rd dollar series. The 100 Billion Bearer Check I found, even though I didn’t know / understand what it was at the time, was part of the 2nd dollar bearer check series, not part of the 3rd dollar series, and so, it was almost completely different from what I was looking for. If you look at the progression of denominations used throughout the rest of the series / history of the Zimbabwean dollars, you’d expect all 5 of those denominations to exist, but none of them do. The only note of those five whose absence seems reasonable at first glance is the $200 Billion, as 20/200 denominations were often skipped in the series. 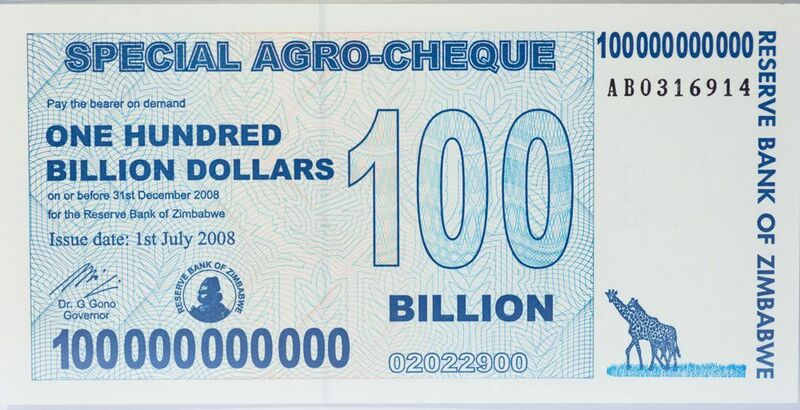 The explanation for this is as simple as it is shocking – the hyperinflation in the country was so severe by November / December 2008, the Reserve Bank of Zimbabwe had to skip all of those and go from 50 Billion straight to 10 Trillion. That 5 note / denomination “gap” in the series is probably the biggest and most notable such oddity in the 100-pick series but it’s hardly the only one. The 3rd dollar series includes no 5,000 dollar note. The series originally maxed out with a $1,000 denomination. When the RBZ chose to start expanding the series to include higher denominations in late September 2008, they announced the $10,000 and $20,000 notes, but no $5,000 note. The 3rd dollar series also includes no $50 note. The 3rd dollar series was rolled out with denominations ranging from $1 to $1,000, but no $50 note, even though the denomination was seen in previous series for the 1st dollar and 2nd dollar. The 3rd dollar series, finally, includes no 5 Million or 20 Million dollar notes. Why these two notes where omitted when the $10 Million, $50 Million and 100 Million notes were announced in early Dec 2008 I don’t know. One of the things that makes the 2nd dollar Bearer Checks and Agro Checks interesting in the context of the larger series is the inclusion of “25” denominations. The 1st dollars, 3rd dollars and 4th dollars all have “20” denominations – like $20, $20,000, $20,000,000. Only the 2nd dollar series has denominations of $250,000, $250 Million, and $25 Billion. The 2nd dollar series, very oddly, has both a $200,000 and $250,000 note. The 2nd dollar does also have a $20 denomination, but I assume this is only because a $25 dollar note would have been just a little too peculiar to have been taken seriously. There is no $200 or $250 note in that series. The king of the oddities may be the $750,000 note of the 2nd dollar bearer check series (ZIM52). This is the only time in the entire 100 note Zimbabwean series that has a “75” fronted denomination. This note makes an interesting partner with the $250,000 (ZIM50) note and $500,000 notes (ZIM51) of the same series. Together they give you a quarter million, half a million, and three quarters of a million dollars for denominations, and this may help explain the inclusion of both a $200,000 and $250,000 note in this series. This is just one of those things about the series that I find interesting and maybe a little strange, and I like to think about it sometimes. The most likely explanations for the skipped notes in most cases is likely the same as the reason for skipping the $100 Billion through $5 Trillion notes in the 3rd dollar series – inflation had already rendered them undesirable before they could even be issued. The budget of the nation may have also played a role. One of the reasons for discontinuing the issuance of the money in 2009 is that the country couldn’t even buy paper / afford to print the notes anymore. Some of these denominations may have been omitted just because the government / RBZ only had so much money for printing new notes and they elected to go for larger denominations to… get more buck for their buck? It’s all a little crazy to think about. Previous entry So PCGS Currency Shutdown... and what of the notes.